In an effort to give right motivation to the youth and young students, the Assam Rifles in Miao conducted an animation session for the students of Light of the World School Miao and Newman School Neotan on 11 February 2017. In the wake of growing number of insurgent movements across the State of Arunachal Pradesh, and amidst rumours of emergence of new factions of late, there have been unconfirmed reports of forceful recruitments to such factions across the State. To stop young students from joining insurgent groups and to give them right motivation, the 13 Unit of Assam Rifles Battalions based in Miao Under the Aegis of Headquarters 25, conducted an awareness programme at the Light of the World School Hall in Miao. 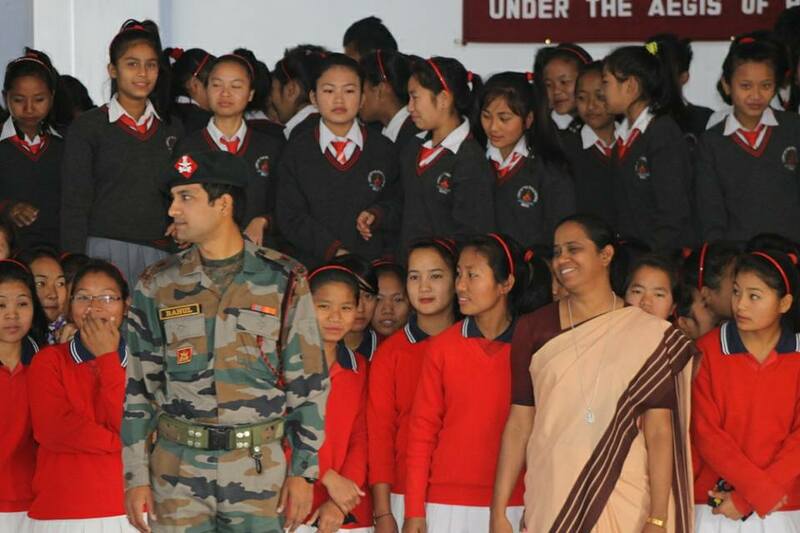 Major Rahul of Jairampur Battalions based in Miao addressed a group of 200 students from Newman School Neotan and Light of the World School Miao. “I am not here to ask you to join the Army. But I am here to help you have the right kind of motivation”, said Major Rahul. As young students it is imperative to have two important qualities – focus and curiosity. Nothing can be achieved without focus and no knowledge is possible without curiosity. You must observe and ask questions, and choose the right thing and walk the right path, he added. Awareness sessions on right motivation will help the youth and young students with right information, said Rev. Sr. Reena George, the Headmistress of the Light of the World School. There has been a sudden increase in the number of insurgent related incidents these days. Two Assam Rifles Jawans were killed by an insurgent group on 29 January and insurgent militant was caught by the Assam Rifles in Miao with the support of Arunachal Police on 2 February.